While getting involved in any accident can be devastating to you, an accident while you are operating a motorcycle can be much worse for you. A collision with a car or large truck can cause you great harm, leading to permanent disabilities that can keep you from ever working again or living your life of the past. When you are faced with a situation such as this, you may not know just where you should turn for answers or how you will get the financial compensation you are entitled to as the victim in this accident. The best way for you to get justice and action is to turn to us at Belal Hamideh Law so that we can act as your motorcycle accident lawyer in Long Beach. If you have suffered serious injuries in your motorcycle accident, you may find that you have to spend a long time in the hospital, undergo multiple surgeries, need physical and occupational therapy following the hospital stay and be left unable to work again. All of these situations can create large financial hardships for you. You will have steep medical expenses without having any means of income to help pay for them. You want to make sure that the party responsible for the accident is held accountable and made to pay for your medical bills now and in the future. You also want to get a settlement that covers lost wages and your inability to work. A motorcycle accident may leave you with both physical and psychological damage that you need to recover from. 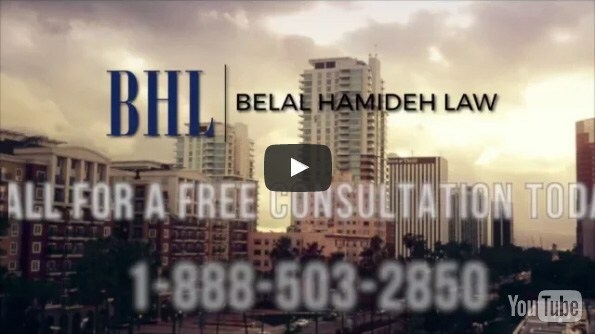 As your motorcycle accident lawyer in Long Beach, we at Belal Hamideh Law will seek to get a settlement or judgment that provides you with compensation that covers your medical and other expenses but also compensates you for any pain and suffering that you have experienced because of the accident. A horrific accident can leave you with unimaginable trauma that you must deal with for years to come and any settlement should provide you with compensation for the suffering you and your family go through. When you are involved in a motorcycle accident, it is to your benefit to speak with a motorcycle accident lawyer in Long Beach as soon as you can to discuss your case. You can give us a call at Belal Hamideh Law at 888-503-2850, and we can arrange an appointment where you can discuss your case with an attorney free of charge so you can see all that can be done to help you get the justice you deserve.